Sir Hugo Theodore Stapleton Blanchflower lies dying peacefully in his home, the castle in Quinster. His dying words, meant only for and heard only by, his wife, Lady Blanchflower, for some reason fill her with terror. But then nine years pass with no apparent incident. Enter Inspector McMorran and his colleague Anthony LOTHERINGTON Bathurst to get to the bottom of the mystery. Once Mrs Whitburn’s body is also discovered, it places a clear puzzle for Bathurst to solve – which of the ladies was the intended victim and which was, for want of a better reason, collateral damage? And why was an actor’s wig found underneath Lady Blanchflower’s body? I thought I’d treat myself for a Christmas read. Oh, I didn’t buy it for Christmas – good luck finding a copy of this one, Brian Flynn’s fortieth book, give or take. I’m going from gadetection’s publication list but there are some errors in it for books published in the same year, so it might by forty-one. Anyone know where I can find a definitive bibliography? It’s the next book after Black Agent (probably) so he’s raided Macbeth again for the title, although slightly more obviously this time. Anyway, on to the book, and it’s a treat, it really is. Flynn’s prose is a lot of fun. It’s possible that it resonates with me in particular for some reason – we’ll see, as Curtis Evans of The Passing Tramp has promised a Flynn review soon – but after a couple of slogs recently (I gave up on the book that was sitting in the Coming Soon window), this was so enjoyable. One of the charms of this series is that Bathurst isn’t flawless. He makes two major errors in pursuit of the killer, and one red herring pitched itself perfectly for me. I twigged it a page before Bathurst spelled it out… and then it was revealed that we were both barking up the wrong tree. To be honest, I doubt this is really a fair-play mystery as too much critical information is revealed late in the day – the meaning of a cryptic note is indecipherable until the very end – but it’s a beautiful scheme from the murderer, if rather ruthless. There’s a lovely clue regarding a picture (which admittedly requires a lot of guesswork from the reader), but any book that contains the line “Oh, I should have mentioned it earlier, but he only had one arm” will always struggle to upset me. No news on Flynn becoming available to the non-collector, I’m afraid – there’s a distinct chance that anyone wanting to republish him will have the same problems that I have, namely finding copies in the first place! But on the off-chance you can find a copy, this is Recommended. Not his finest work (see Invisible Death and Tread Softly) but a lot of fun. Oh, and that’s another DIY cover, I’m afraid… No trace of anything on t’Internet. Previous Competition Results – and Merry Christmas! ah this post has finally come up in my wordpress news feed. Occasionally over the last few weeks not all of your posts have been appearing in the feed at the time you publish them. Hope someone does reprint him soon or that I can have the charity shop find of the century and find some as I do feel like I want to give him a try. I posted my Flynn review on Christmas Day, in the morning! I hope to have good news for you soon. 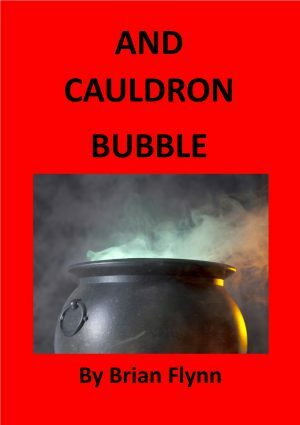 Almost picked this one but passed it over for And Cauldron Bubble. Glad to see that you mostly enjoyed it.